Inspired by the previously covered Crimson Guitars’ 05Ric Extended Range Bass, John Garncarz set out to build his very first custom guitar based on this design. With mainly a background in lathe turning it’s quite a first guitar project – taking about 9 months to complete. The pickups are recessed in the body, under the fingerboard, aft of the last fret. Each pickup is a sewing machine bobbin with a neodymium magnet in the center wrapped with 43 gauge wire. 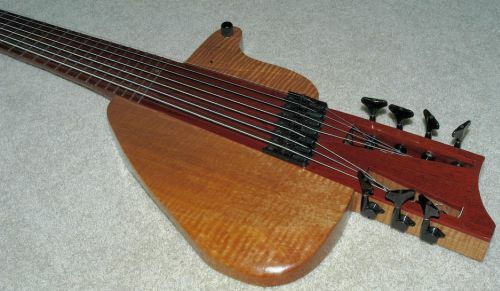 Imagine the Ned Steinberger upright bass individual pickups, but hidden. All seven are wired in series through a single volume control. Seven Hipshot triple lock down individual string bass bridges handle the strings on their way to the Gotoh tuners located at the rear of the guitar. It’s an approach we’ve previously seen on the Soloette headless guitar. As John told me, it was “a lot of work for my first stab at building a custom musical instrument” but clearly worth the effort. Thanks for sharing your project, John! What a beautiful instrument! I have a question about the pickups. Do you know the ohms of them and did you use magnets the full depth of the bobbin? Also how close are the pups to the strings? The time was very well spent on your creation. Each pick up is wound to ~ 2,000 ohms. In series, they total 14.3K ohms. The neodymium magnets are .25″ in diameter and .5″ in length (the full depth of the bobbins). There is also a bottom steel plate connecting all the pick ups (ala telecaster). The pickups are 11 mm from the string bottoms. 3 mm of wood and 8 mm of air. Very cool John! I would love to see and hear a video of it being played. I hope you keep up the very imaginative work.